You are planning to buy a new iPhone 7 but the model you want to have, the premium jet black finish with 128GB, is neither available at Apple stores in your area nor at any of the online shopping sites. Now the Apple website does have a simple tool to help you check the availability of iPhone, or iPad or any other Apple product, at their retail stores but you still need to perform these inventory checks manually. Wouldn’t it be easier if these checks could be automated? You specify the iPhone model you wish to own, your preferred color, capacity, your area zip code, your desired carrier and the tool would send you an email alert when iPhone is back in stock at any of the Apple retail stores in your area. It’s like having someone check the Apple website for iPhone availability every few hours. 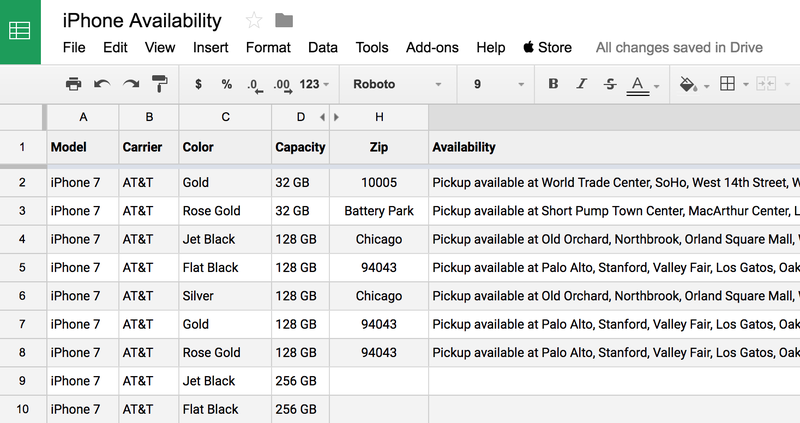 What we have here simple Google Spreadsheet, that resides in your Google Drive, and it will monitor the Apple store in the background for iPhone availability. When any of the iPhone models in your watchlist are back in stock at any of the nearby Apple Stores, you’ll get an email alert. The email alerts (see sample alert) will also include a directly reservation link to help you book the device online for in-store pickup rather than having to drive down to the store. Click here to make a copy of the Apple Tracker sheet in your Google Drive. The sheet has a list of every possible iPhone variant available at Apple Stores. Put your ZIP code, or your locality, against any iPhone model that you wish to monitor for availability. Go to the Apple Store menu (near Help menu), choose Start Tracker and authorize the script. You only need to do this once, the script is open-source and none of your data ever leaves your Google account. The Google Script will check the inventory of all Apple Stores in the specified zip code and will send email alerts if it finds a store where your favorite Apple iPhone model is available for pick up. The email alert will also include the Apple store’s address and phone number. Later, if you need to completely disable tracking, open your Google sheet and choose Uninstall from the Apple menu. If you need to remove tracking from certain iPhone models, just clear the corresponding ZIP column for that row.